It seems that only recently I have reviewed Uit Oude Grond album from the Dutch pagan/folk metallers Heidevolk, and yet we meet again. The collective seems to be pretty prolific, now coming up with something which is a first for them, a concept album. 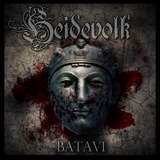 Not drifting far away from their preferred range of topics, Heidevolk commit to music an interpretation of a portion of the history of the Batavi Germanic tribe, specifically their revolt against the Romans and its bloody suppression. Ours is not a history forum to check accuracy of the story through Heidevolk’s view prism, and I would not be able to do it anyway since the lyrics are (as in the past) all in Dutch, and that language is not one of my strong suites. At the same time, the Batavis are one of the tribes at the cornerstone of the Dutch ethnicity, and throughout history they were hailed as fearless and proud warriors, capable of swimming across rivers and lakes in full armor gear. A Roman legion was named after them, and the Romans themselves realized the threat to their empire from the Batavi rebellion, but even after it was brutally suppressed the conquerors maintained a healthy dose of respect for the Batavis due to the courage and valor the latter exhibited. All in a all – a very fitting subject matter for Heidevolk to address. From the first notes of the opener Een Nieuw Begin I sensed a mood change from Uit Oude Grond. Pushed forward by more thundering and voluminous drum sound, the atmosphere on Batavi is way darker. There is a lot less joy in the air and a lot more battle and destitute life-shaped hardship coming through from Heidevolk on this album. The use of tremolo and some blast, and even more violent notes on Als de Dood Weer Naar Ons Lacht at times makes Heidevolk sound close to Amon Amarth, save for the clean vocals. Speaking of the vocals, Heidevolk still maintains two vocalists, and the two voices, both clean, make for a perfect group/gang/tribe presence. Batavi does not purposefully seek out folk melodies to rely upon, like some cuts on Uit Oude Grond did, or any sing-along melodies for that matter period. The most melodic song on the album De Toekomst Lonkt leads off with the calling longing melody set to pretty fast chops, and Einde der Zege shows the relationship between Heidevolk and other Germanic bands like Tyr, through the melodic dreaminess-to-heaviness shifts. Other than that, what comes through the most on Batavi is the feeling of a fight doomed to ultimate defeat, the tribal hall celebration after a long slate on a battlefield (Het Verbond met Rome), the fate of the suffering down-on-your-luck people who put up a valiant fight (Vrijgevochten). The outright folkiness is coming through only on violin/acoustic guitar instrumental Veleda and is squashed rather quickly by the overall heaviness on the cuts like Wapenbroeders. Overall, it seems to me that Batavi is a step forward for Heidevolk. The album is very cohesive, not mired into unnecessary sidebars, and you can take it in one quick breath. With Batavi Heidevolk is one step closer to defining their identity as a heavy pagan band, rather than some fruity folk collective. The history of Europe around the end of AD – early BC was full of brutal bloodletting, and Heidevolk makes no effort to sugarcoat.